A couple of months ago I interviewed Joel Esposito about the state of robotics education for the ROS Developers Podcast #21. On that podcast, Joel talks about his research on how robotics is taught around the world. He identifies a set of common robotics subjects that need to be explained in order to make students know about robotics, and a list of resources that people are using to teach them. But most important, he points out the importance of practicing with robots what students learn. Done! So what do I have to do now if I want to move the robot gripper close to this bottle? You need to compute the Jacobian. Let’s do it! Create a program that manually introduce a desired position for the end effector. Then based on that data, compute the Jacobian. I understand that learning and studying theory is a big part of robotics, but not the biggest. The biggest should be practicing and doing with robots. For that, I propose to use ROS as the base system, the enabler, that allows practical practice (does that exist?!?!) while learning robotics. I propose to teach ROS at the same time that we teach robotics, and use the former during the whole robotics semester as a tool to build and implement the robotics subject we are teaching. The idea is that we use ROS to allow the student to actually practice what they are learning. 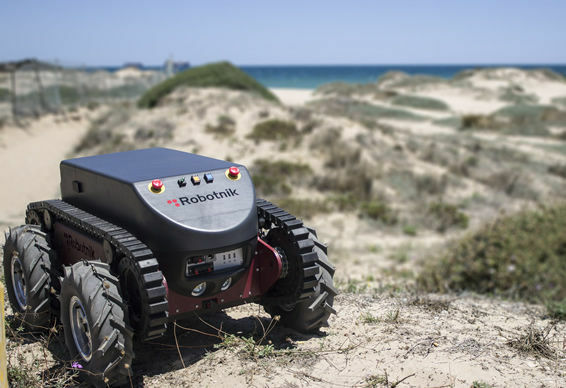 For instance, if we are talking about the different algorithms for obstacle avoidance, we also provide a simulated robot and make the student create a ROS program that actually implements the algorithm for that robot. By following this approach, the learning of the student is not only theoretical but instead includes the practice of what is being told. The advantage of using ROS in this procedure is that ROS already provides a lot of material that can provide a working infrastructure, where you as a teacher, can concentrate on teaching the student how to create the small part that is required for the specific subject you are teaching. We have so many tools at present that were not available just 5 years ago… Let’s make use of them to increase the student quality and quantity of learning! Instead of using Powerpoint slides, let’s use interactive Python notebooks. Instead of using a single robot for the whole class, let’s provide a robot simulation to each student. Instead of providing an equation on the screen, let’s provide students the implementation of it in a ROS node for them to modify. What I preach is what I practice. This is the method that I am using on my class of Robot Navigation at the University of LaSalle in Barcelona. In this class, I teach the basics about how to make a robot autonomously move from one point in space to another while avoiding obstacles. You know, SLAM, particle filters, Dynamic Window Approaches and the like. 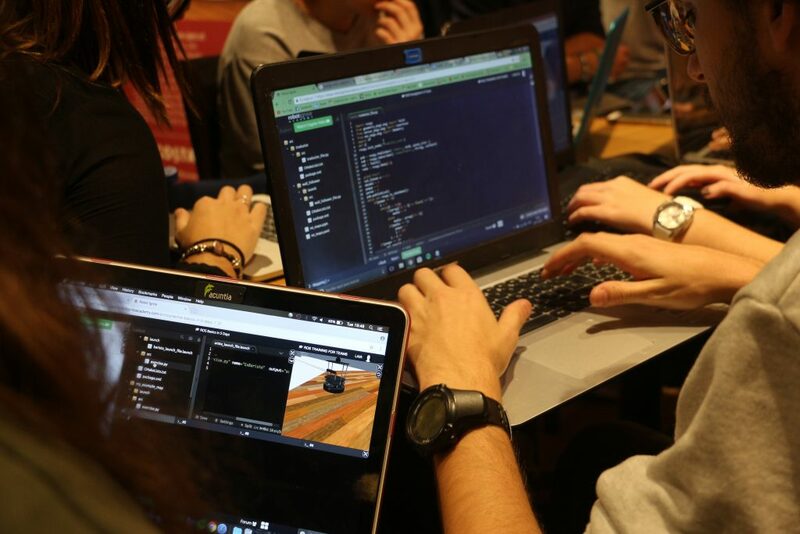 As part of the class, students must learn ROS and use it to implement some of the theoretical concepts I explain to them, like for example, how to compute $odometry based on the values provided by the encoders. However, I’m not the only one using this method to teach robotics. 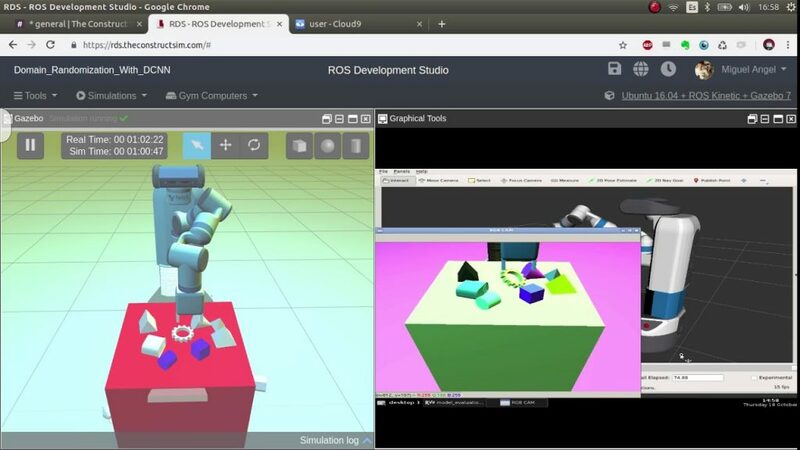 For example, professor Ross Knepper from Cornell University explained to me on Using ROS to teach the foundations of robotics for the ROS Developers podcast #23, how he teaching of ROS and robotics in parallel. He even goes further, forbidding students to use many ROS software like the ROS navigation stack or MoveIt! His point is very good: he wants the students to actually learn how to do it, not just how to use something that somebody else has done (like the navigation stack). But he uses the ROS infrastructure anyway. Then you start explaining the robotics subject of your choice, making the students implement what you are teaching in a ROS program, using robots. I advise to use simulated robots. It is not necessary to dedicate too much time to those subjects, just the necessary time for them to know about ROS. Deeper knowledge and understanding of ROS will be learned by practicing along the different classes of the semester. 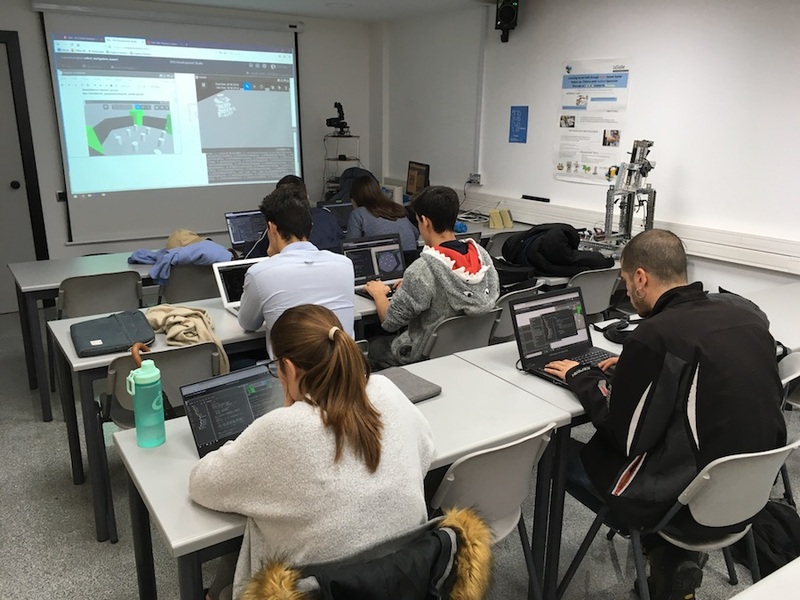 While they are trying to create the software for the implementation of the theoretical concepts, they will have to practice those concepts, and ingrain them deeper into their brain. I would also recommend that at this step you forget teaching about creating custom messages, or what are services or action clients. That is too much for such an introductory class and it is very unlikely you are going to need it in your next robotics class. An interesting point to include here is what professor Knepper indicates: he creates some exercises with deliberate errors, so the students learn to recognize situations where the system is not performing correctly, and, more important, to create the skills necessary to figure out how to solve those errors. Take that point also into consideration. At some point in time, you may need to create a custom ROS message for the robotics subject you are teaching. Or you may need to use a ROS service because you need to provide a service for face recognition. Whatever you need to explain about ROS, now is the best moment. Use that necessity to explain the concept. What I mean is that explaining a concept like ROS action servers when the student has no idea what this could be used for is a bad idea. The optimal moment to explain that new ROS concept is when it is so clear for everyone that the concept is needed. I have found myself that explaining complex concepts like ROS services when the students don’t need them makes it very difficult for them to understand, even if you provide good examples of usage. They cannot feel the pain of not using those concepts in their programs. Only when they are in the situation that actually requires the concept, only then are they going to feel the pain, and the knowledge is going to be integrated into their heads. Keep pushing this way. Move to the next subject. Provide a different robot simulation. Request the students implement the concept. And keep going this way until you finish the whole course. Testing with simulators is good because it provides real life-like experience. However, the real test is when you use a real robot. Usually, Universities do not have a budget for a robot for each student, that is why we have been promoting so much the use of simulations. However, some real robot experience is necessary, and most universities can afford to have a few robots for the whole class. That is the point where the robotics project come into action. Finally, decide a day when you will evaluate the project for each team. That is going to be called demo day. On demo day, each group has to show how their code is able to make the robot perform as it is supposed to. For example, at LaSalle, we use two Turtlebots for 15 students. The students must do teams of two people in order to do the project. Then, on demo day, their robot has to be able to serve the coffee on a real coffee shop in Barcelona (thank you Costa Coffee for your support!). 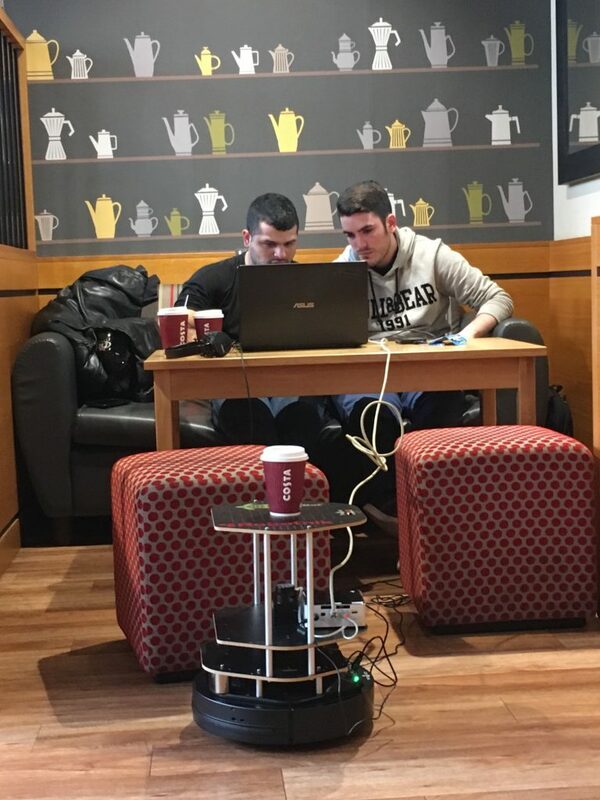 All the students go to the coffee shop with their programs, and we bring the two robots. Then, while one team is demonstrating on one robot, the other is preparing. In case you need ROS certified robots, let me recommend you the online shop of my friends: ROS Components shop. That is where I buy robots or pieces when I need them. No commission for me recommending it! I just think they are great. One very important point in the whole process is how to evaluate the students. In my opinion, the evaluation must be continuous, otherwise the students just do nothing until the previous day of the exam. Afterward, everyone complains. At LaSalle, I do an exam of one hour every month, covering the topics I have taught during that month, and the previous months too. In our case, the exams are completely practical. They have to make the robot perform something related to the subjects taught. For example, they have to make the robot create a map of the environment using an extended Kalman filter. I may provide the implementation of the extended Kalman filter for straight usage, but the student must know how to use it. How to capture the proper data from the robot, how to provide that to the filter, and how to use the output to build the map. As an example, here you can find a ROSject containing the last exam I gave to the students about dead reckoning navigation. The ROSject contains everything they needed to do the exam, including instructions, scores, and robot simulations. That leads us to the next point. How am I going to create all that material? How can I provide my students with a running environment where to execute that bunch of simulations and ROS code? Preparing the material is a lot of work. And more important, there is a lot of risk. When you prepare such material, there is a large probability that what you prepared does not work for the student’s computer. That is why I propose to use an online platform for preparing all that material, and share the material inside the same platform, so you will be 100% sure that it will work no matter who is going to use it. I propose to use the ROS Development Studio. That is a platform that we have developed at our company, The Construct, for the easy creation, testing and distribution of ROS code. This sharing feature makes it very easy also for the students to share with you their program for evaluation, in case of exams, or to help students when they are stuck while studying. Since the ROSject contains all the material, it will be very easy for you to correct the exam in the conditions the student created the program, without requiring you to copy files or set up your computer environment. Just tell the students to share with you the ROSject link. We use the ROSjects at LaSalle to provide the different lessons and exercises. 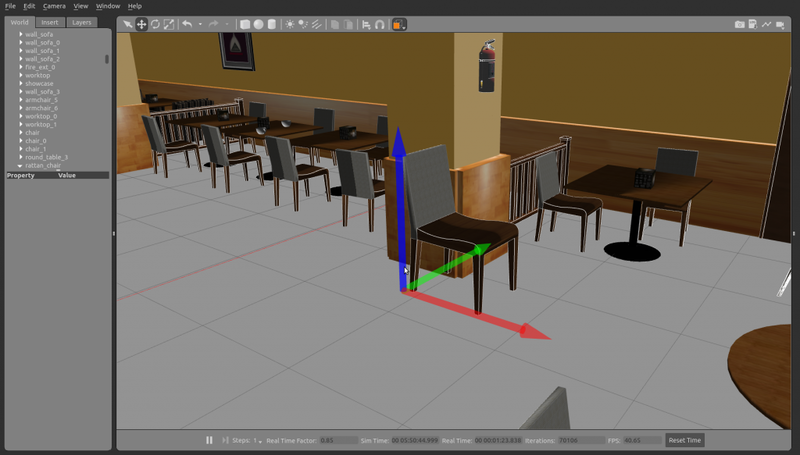 For example, we have a ROSject with the simulation of the coffee shop where the students will do the project evaluation. Also, we use the ROSject to create the exams (as you can see in the previous section). However, if you do not want to wait until they are created, I can recommend you our online academy the Robot Ignite Academy, where we provide already made ROS-based courses about deep learning, manipulation, robot perception, and more. The only drawback is that the academy has a certain cost per student. However, it is highly recommended because it simplifies your preparation. We use the Robot Ignite Academy at LaSalle, but many other Universities use it around the world, like Clarkson University (USA), University of Michigan (USA), Chukyo University (Japan), University of Sydney (Australia), University of Luxembourg (Luxembourg), Université de Reims (France) or University of Alicante (Spain). Finally, I would like to make a point about a problem that I have identified when using this method. If that is your case, first I would recommend that you reduce the scope of learning programming to the use of Python. Do not go to C++. C++ is too complex to start teaching it together with robotics. Also, Python is very powerful and easy to learn. I usually create an initial class about Python and Linux shell. I do this class and immediately, on the next week, I do an exam to the students about Python and Linux shell. The purpose of the exam is to stress to the students the importance of mastering those programming skills. They are the base of the rest. Additional problems that you may find is that the students have problems understanding English. Most of ROS documentation is in English. The way to communicate in the ROS community is in English (whether we like it or not). You may feel tempted to create the course notes in your mother language, and only provide documentary resources in your own language. I suggest not to do it. Push your students to learn English . The community needs a common language, and at present it is English. I started this post talking about the findings of Joel Esposito. Even if you listen to the podcast interview, you will see that his final conclusion is actually NOT to use ROS to teach robotics. I’m sure there are other teachers with the same opinion. Other teachers like professor Knepper do advocate for the opposite. Those are points of views, like mine in this article. I recommend you listen to the podcast interview with Joel so you can understand why he suggests that.